Delhi, India's capital, was once foremost regarded as a staid and sensible city of bureaucrats. Its long and divergent history has seen it conquered by the Mughals, colonized by the British, and settled by refugees from the Partition (of India and Pakistan) following Independence. More recently, another revolution of sorts has been going on, with the reinvention of unremarkable neighborhoods into cosmopolitan destinations to explore in Delhi. Here's the pick of Delhi's cool neighborhoods that are close to top tourist attractions in the city. Connaught Place (or CP for short) is New Delhi's central business district. It was built by the British and completed in 1933. The layout consists of three rings (inner, middle and outer) of colonnaded white Georgian-style buildings, with a park in the center. Considered to be the heart of the city, key roads radiate out of it in all directions. Those who are familiar with Delhi will remember Connaught Place as being a rather boring shopping arcade with a few gloomy bars, and uninspiring leather and clothing stores. Not anymore! The opening of the Metro train station invigorated the neighborhood, and it's now one of the liveliest in the city. Cool bars and restaurants continue to spring up at a staggering rate, and Delhi's party people congregate there for the nightlife. Most of the action takes place in the Outer Circle, while the Middle Circle has banks and offices. Feeling hungry? Here's what to eat in Connaught Place. Other attractions in the area include the serene Gurdwara Bangla Sahib (Sikh house of worship), Prachin Hanuman Mandir (a very old temple devoted to Lord Hanuman, the monkey god), Janpath market, Agrasen ki Baoli (an ancient step well), and Devi Prasad Sadan Dhobi Ghat (where laundry is manually washed in rows of troughs). How to Get There: Take the Blue or Yellow line of the Delhi Metro train and get down at Rajiv Chowk, which is an important interchange station. It's located right in the middle of Connaught Place, below Central Park. Undoubtedly Delhi's hippest neighborhood, Hauz Khas Village has a fascinating medieval history that dates back to the 13th century. The neighborhood gets its name, meaning "royal water tank" from the reservoir that was built there. It's now encircled by a paved walking track and forms part of the Hauz Khas Complex (entry is free). This area also includes the remains of a fort, a madrasa (an institution for Islamic learning), mosque, and tomb of Firuz Shah (who ruled over the Sultanate of Delhi from 1351 to 1388). There's a popular Deer Park adjacent to it as well. Hauz Khas didn't start becoming cool until the 1980s though, when it was redeveloped as an upscale commercial and residential area. Currently, this urban village is filled to the brim with chic boutiques, art galleries, restaurants and bars. Some would say its even overcrowded and overrated. The Kunzum Travel Cafe is a great place to hang out! Also try these popular restaurants and bars in Hauz Khas. How to Get There: Hauz Khas is located in south Delhi and is accessible via Sri Aurobindo Marg. It has a stop on the Yellow Line of the Delhi Metro train but you'll need to take an auto rickshaw from the station or walk about 20 minutes to get to the village. Alternatively, you can get off the train at Green Park Metro station on the same line. It's around the same distance away. New Delhi's Lodhi Colony was formed in the 1940s, as a residential colony for government officials. It's situated in clean and green Lutyens' Delhi, and was the last residential area built by the British before they left India. Sounds more dull than cool, right? However, Lodhi Colony has India's first public open-air art district. 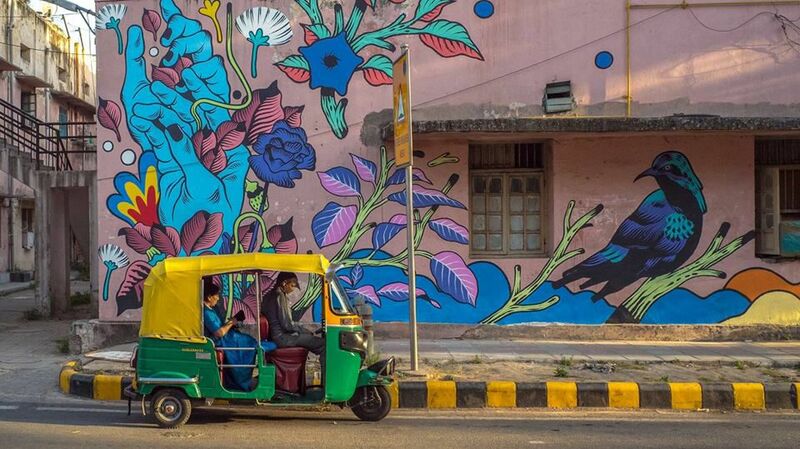 The St+Art India Foundation brought in artists from across India and the world to paint murals on buildings between Khanna Market and Meher Chand Market. What's more, Meher Chand Market has also transformed itself over the past decade. No longer a market renowned for its tailors, they've been replaced by eclectic and stylish home decor stores, cafes, boutiques, and specialty bookstores. While Hauz Khas is more of a food and beverage destination these days, Meher Chand Market is distinctly designer-focused. Lodhi Gardens, one of Delhi's popular attractions, is nearby. While you're there, stop by these top restaurants in Lodhi Colony for something to eat. How to Get There: Lodhi Colony is accessible via Lodhi Road. Take the Yellow Line of the Delhi Metro and get down at Jorbagh. Or, take the Violet Line and get down at JLN Stadium. Shahpur Jat, another arty urban village, is often overshadowed by Hauz Khas Village 10 minutes away. But during the last decade, designers have relocated to Shahpur Jat, drawn by the lower rents and more peaceful atmosphere. The fact that many locals were skilled weavers and artisans was an added benefit. Shahpur Jat was built on the remains of Siri Fort, which was established by the Khilji dynasty in the early 14th century. It remained an agricultural area until the 1960s, when the government started acquiring farming land to develop housing for senior officials. The neighborhood is no longer only an edgy designer hub. Health-conscious hipsters now flock to the many wholesome cafes and shops nestled into its narrow streets. Shahpur Jat also has colorful street murals on its buildings, created by the St+Art India Foundation. How to Get There: Hauz Khas is the nearest Metro station. Refined and sedate Sundar Nagar has been turning increasingly cool in recent years too. This New Delhi neighborhood gets its name from Sundar Bawa Singh, who was the first person to buy a plot of land there, when the government began to develop it in the 1950s. The neighborhood has a fabulous central location, bordering the Lutyens' zone and wedged between historical monuments (Purana Qila to the north and Humayun’s Tomb to the south). Sundar Nagar market is one of the top Delhi markets. It's renowned for its fine Indian tea stores, art and antique shops, and jewelry shops. Check out Gallery 29. There's been an influx of new and trendy restaurants as well. What's more, the neighborhood is home to two of Delhi's top boutique hotels (La Sagrita and Devna), and Delhi's zoo. If you're in the city during Diwali, don't miss the popular fair that takes place at Sundar Nagar Park. How to Get There: Sundar Nagar is accessible via Mathura Road. It doesn't have a Metro station. The nearest ones are Khan Market and JLN Stadium on the Violet Line, and Pragati Maidan on the Blue Line. Just south of Sundar Nagar and east of Lodhi Colony, Nizamuddin is divided into vastly different East and West parts. The main attraction in Nizamuddin West is the shrine of the Sufi saint Hazrat Nizamuddin, and the live qawwalis (Sufi devotional songs) that are held there every Thursday evening. It's worth taking this insightful and inexpensive tour of the densely inhabited surrounding area, known as Nizamuddin Basti. In contrast, cooler Nizamuddin East is a wealthy residential neighborhood where numerous celebrities, politicians, authors and journalists live. This part of the city was originally developed to house refugees, who fled what's now called Pakistan in the Partition. They've since sold their properties to wealthier owners that have built lavish bungalows. You'll find varied places to eat in and around the neighborhood, from fine-dining to street food. If you want to stay there, Nizamuddin also has some of Delhi's best bed and breakfasts. Women who love gorgeous block-printed clothes will definitely want to visit the Anokhi discount store in Nizamuddin East Market (Shop 13, enter through Gate 9). And, of course, Humayun’s Tomb is a must-see. How to Get There: The closest Metro stations are Jangpura and JLN Stadium on the Violet Line. Paharganj? Cool? Those who can't stand its filth, noise and congestion may have a hard time believing so. Yet, Paharganj is evolving from seedy to sought-after! The neighborhood is an old market area that came into being in the 18th century. It was the only market situated outside the walled city and Mughal capital of Shahjahanabad (now known as Old Delhi), and was the city's largest grain market. Paharganj gained notoriety in the 1970s, when it became a fixture on the Hippie Trail. Backpackers looking for cheap and centrally located accommodations also started gravitating there. Nowadays, hippies are encountering hipsters, who are heading to Paharganj in search of happening new places to hangout. Although the Main Bazaar is still dominated by foreigners, it's in vogue with young Indian college students for bargain shopping, and inexpensive food and drinks.